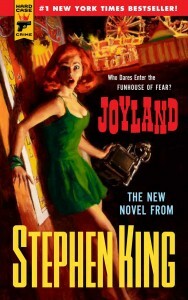 Joyland is an interesting take on the classic pulp-fiction genre. It contains stylistic elements of classic, hard-boiled crime stories ala Dashiell Hammett or Raymond Chandler. Combine this with the signature Stephen King delivery of a creepy atmosphere and the mounting sense of foreboding that readers are accustomed to and you are in for an exciting read. In the opinion of this writer, this widens the appeal of the work because it is accessible and enjoyable to readers of both crime and horror genres. The main character is the likably awkward, Devin Jones. He is a typical college student who finds a summer job at his local amusement park, Joyland. Over the course of the summer, Devin learns the park routine and carny lingo. More importantly, he is told about the legend of a ride at the park being haunted by a murdered girl. During the same time period, he makes friends with a sick child who lives in town. The storyline tightens as King draws together the threads of the plot into a tense spider’s web of factors. The pace of events increases relentlessly as the situation spirals out of control. Will Devin discover who the murderer is, before they claim another victim? Will he get the girl? Check out the library’s copy of Joyland and find out!